Hello folks, and what brainboxes some of you are! yes, the quiz answers are flooding in...I've even had an entry from as far afield as New Zealand, but, if you haven't had a go yet, there's still time to enter. Just email me with your answers by early next week...you have to be in it to win it as they say! I'm sorry that I've been somewhat absent for the last week, but it was a mixture of no photos to share and being quietly busying myself with an assortment of things. Last Thursday I was teaching at Crafts 4 U 2 Do and in the morning the ladies made an array of tags. Here is one that we ran out of time to make! This one features Darkroom Door stamps, Graphic 45 Christmas Emporium papers (which Personal Impressions are now stocking - yippee!) Tissue Tape and a Christmas Muse token by TH. I do like the tissue tape as ribbon effect. In the afternoon we used Darkroom Door stamps to make cards and this one was David's favourite of the samples I made. 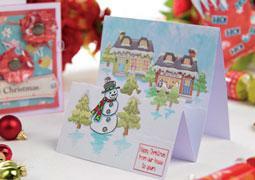 The lovely paper is Christmas Emporium "Believe!" which has postcard sized retro images on the front and this beautiful blue paper on the reverse. I used Faded Jeans to ink the postage stamp and then, once I'd applied it to the paper, lightly misted it with water for that slightly blurred effect. On Saturday I was at Crabapple Crafts who were celebrating their twelfth birthday. Rosemary and Debbie were also demonstrating as well as Woodware and even Nigel got in on the act. Hello to everyone who came along and glad you enjoyed the day. I have added an email subscription to the sidebar near the top - if you'd like to get my posts sent to you via email (!) just add your email details and follow the simple instructions. Hopefully it will work...I'm never too sure if I have done things correctly or not! Crafts Beautiful's current issue features a set of cards and decoration that I made using Nitwit papers and toppers - along with some inks of course! Here are a couple of pictures featuring the stocking.... ....and one of the cards - though you can see the second card in the background. 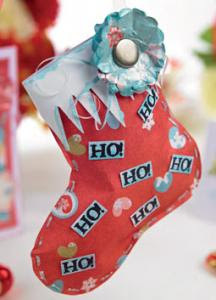 The magazine includes the template for the stocking and full instructions of course. So, not a very long post tonight really! I am just about to go and call Thomas for his dinner as he has been out enjoying the weather all day. It's been incredibly warm here and, at 7.15pm in late September, we have the windows open and the fan on - and it still feels hot! Bonkers! david cooked a really delicious chicken, stuffing and baked potatoes last night, so we are going to have the same again now...he hasn't cooked a roast for a while but it was worth waiting for! I am off up to Lancaster on Saturday for my demonstration at Card Craft and from there I travel over to Hull for Sunday's demo at crafty Creations in Cottingham. Hope to see some friendly and familar faces at Lancaster and some new ones on Sunday! 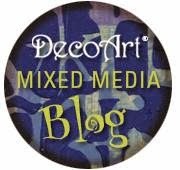 Finally, a warm welcome to new followers of my blog. I'm missing all these new cards and agree about the tissue tape ribbon. What a brill idea. I thought about you last Saturday and hoped you got to sit down! We are home now and catching up slowly as I'm a bit poorly now!!!! Won't keep me down though. Enjoy your travels. Fancy going to Hull now I don't have to - bad planning somewhere. Love the Christmas tag (and what a great idea with the tissue tape!). Love that tag Lindsay, and your clever idea with tissue tape. Might get to Lancaster, not sure yet! Temperature tower on Parkway last night was 22 at seven o'clock and when I came back at ten had only dropped to 19!! !